While some people allow their wild side to come out more often than others, we all have a little wild child inside of us. 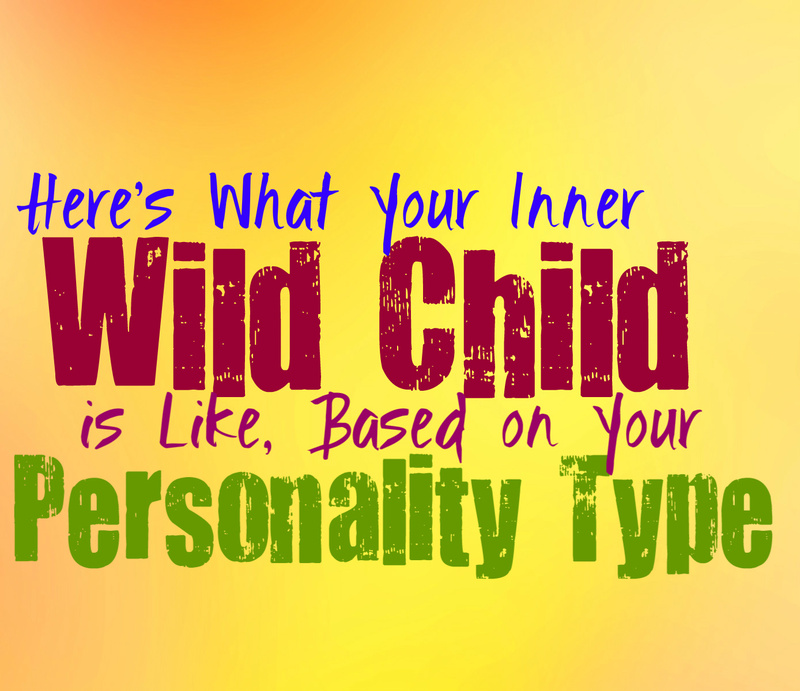 Here is how what your inner wild child is like, based on your personality type. INFJs can seem a bit stoic and reserved in front of most people, but deep down they do have a wild child side to them. When the INFJ is comfortable with someone they can become a bit goofy and might express a more eccentric side of their personality. They are intuitive and complex people, who can be very passionate when it comes to their loved ones or the things that excite them. While INFJs might keep a lot of their desires inside, they do have a spontaneous side that comes out on occasion. The wild child side of the INFJ is explorative, fearless and even occasionally reckless. ENFJs can be seen as focused and responsible people, but they do have a wild side to their personality. While their main focus is caring for others ENFJs can be truly passionate people. They are outgoing and friendly people, who can certainly let their freak flag fly. They know how to have fun and aren’t afraid to take a few chances in life. ENFJs aren’t uptight people, even though they believe in being responsible and doing the right thing. Their wild side often includes the ENFJ dragging their friends along with them for exciting adventures and a little over the top fun. INFPs can seem a bit quiet and reserved sometimes, but in truth they definitely do have an inner wild side. INFPs require feeling comfortable with someone for them to truly show their inner feelings and desires. When the INFP finds someone they trust they can show them their spontaneous and even eccentric qualities. They enjoy being able to explore new thing, and desire new experiences to keep their active minds entertained. The wild side of the INFP is fun, spontaneous and ready to explore things that even seem a bit frightening to others. ENFPs definitely have an inner wild child, since they enjoy having fun and experiencing life to the fullest. ENFPs don’t like to be held back, and will dive into things head first. When it comes to ENFPs they do things in an all or nothing sort of way, and dislike only accomplishing something halfway. ENFPs can certainly get a little wild, especially since they are such spontaneous people. They aren’t afraid of taking chances in life, since it can lead them to learning something new. ENFPs can be wild in many ways, since they aren’t afraid of exploration. INTJs are often seen as stoic and reserved people, since they are so focused on their own inner worlds. INTJs are always trying to improve themselves and enjoy learning and exploring information. While INTJs are often responsible people who believe in thinking through their choices before acting. This can keep their wild side a bit stifled, but that doesn’t mean it never comes out. The wild side of the INTJ is often present around the people they trust who can bring it out in them. The INTJ who is normally reserved will be passionate, intense and even a bit spontaneous. ENTJs are driven and hardworking people, but they do have a wild side to them. While ENTJs put their work ethic first, they do know how to have fun when the time calls for it. ENTJs can be adventurous and even a bit larger than life at times, which makes them exciting and fun to be around. ENTJs are social people who enjoy connected with others, and want to make sure to show them a good time. While INTPs are seen as quiet and maybe even reserved people, they do have an inner wild child. INTPs enjoy exploring new things, When the INTP has felt shut in for too long, they can often let their spontaneous side out in a rather intense way. They might be the type to randomly pick up and go on a long road trip, just to experience something new. They aren’t afraid to take a few chances in life, especially when they have people who support this side of them. ENTPs definitely have a very active wild side, and enjoy being able to experience new things. They are passionate people who aren’t afraid of taking chances in life. While ENTPs are logical people, they believe in learning through experiences. ENTPs can be spontaneous, adventurous and even a little bit reckless at times. They want to experience life to the fullest and don’t enjoy feeling held back in any way. ENTPs will jump into something new without fear, and will even make a few jokes about the situation when they make a mess. ISTJs are often very reserved and hardworking people who want to focus on building a positive future. They don’t want to do anything that might compromise their life or the happiness of their loved ones. While ISTJs value responsibilities and focus, they do know how to have a good time. The wild side of the ISTJ comes out when they are around people they are most comfortable with. They will be a bit goofy and even a little eccentric when the right people bring this out in them. ESTJs are very hardworking people who value being responsible. They want to focus on getting things done and don’t want to let anything get in the way. While ESTJs are mainly interested in being efficient, they do have a wild side as well. Since they have excellent work ethic, ESTJs enjoy being able to unwind and let loose on occasion. Their wild side is often outgoing, boisterous and ready to take chances. ESTJs know how to explore the fun side of their personality without getting into too much trouble. ISFJs are reserved people who don’t want to do anything that might harm their loved ones. They are responsible because they find it important to tend to the needs of others. They don’t want to compromise their relationships, but that doesn’t mean ISFJs don’t have a fun side. Their wild side often comes out at surprising times, when the ISFJ has felt stifled for far too long. They might go out and have a few extra drinks, and expose a more adventurous and even reckless side when the mood strikes them. While ISFJs don’t appear adventurous, they often have a wild side which they keep hidden. ESFJs aren’t often seen as the wildest people, since they prefer to focus on getting things done. They care about their loved ones and value being responsible and hardworking. While ESFJs prefer to focus on taking care of the needs of others, they do have an inner wild child just waiting to come out. They simply need to be around people they are most comfortable with in order for the ESFJ to expose their more spontaneous and adventurous side. They can definitely be risk taking people when the right mood strikes them, which can often surprise others. ISTPs definitely have a wild side, which they let out fairly often. They are spontaneous people who enjoy being able to experience new things. They don’t enjoy feeling held back and want to be able to go after whatever they want. ISTPs have a wild side that appears fearless and ready for anything new. They live in the moment and make choices based on what will give them the most joy. They want to be able to truly experience things, and enjoy being able to learn from those experiences. ESTPs are hardworking people but they are also extremely fun and spontaneous. Their inner wild child is actually much more actively present in their personality than many other types. ESTPs want to experience life to the fullest and live very much in the present moment. The wild side of the ESTP is fearless and open to whatever comes their way. They don’t want to feel held back and are eager to jump into something new and exciting. ISFPs can seem a bit quiet and timid, but this is only what they show strangers. The inner wild child of the ISFP is spontaneous, adventurous and passionate. They want to experience new things in a somewhat reckless and rather exciting way. The ISFP follows their heart in whatever direction it might lead, without reservation or fear. They would rather experience life to the fullest and don’t enjoy feeling like they have missed out on something. ESFPs are spontaneous and passionate people, which is why their inner wild child is often present in their actions. ESFPs want to truly experience life and don’t enjoy feeling regret towards their lack of action. Their wild side is adventurous and ready to jump into something new without a moment’s notice. They will likely drag their loved ones along for the ride, so they can experience the excitement and fun.